This new Fox Labs Keychain Flip Top pepper spray is safer and more secure when you carry it than other keychain pepper spray models. 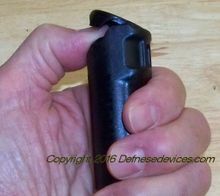 It still carries the hottest and most effective pepper spray formula known to man that won't cause any permanent harm. This unit has been re-designed from the ground up and is not refillable. The part you grip is only 3.75 inches tall and 1.5 inches at its widest. The unique feature is the flip top lid which covers the firing button. It is totally secure in your purse or pocket and cannot be fired unless you sneak your thumb or finger under the flip lid. It is NOT childproof, but more secure against accidental release of its contents and possibly a little faster to deploy since the spraying only requires one direction movement of your firing finger/thumb. This new unit is ambidextrous and comes with a quick release keyring. Range is still 8-12 feet and about 1/2 oz of formula capacity. Manufacture Date is stamped on the outside of the case. Fox Labs does not determine a hard expiration date. Manufacturer Warranty is good for 2 years from purchase or 3 years from date of can.